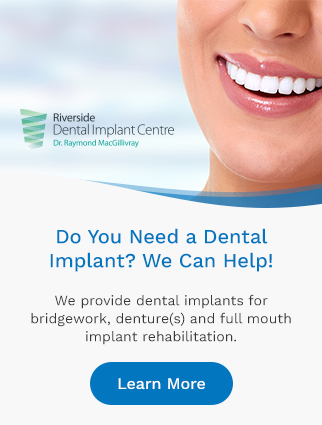 At Riverside Dental Implant Centre, we offer full-service dental implants for patients. Learn more about getting dental implants in Sydney River. Dental implants are artificial tooth roots that fill gaps in your smile and replace your missing teeth. Implants can be used to replace a single missing tooth, multiple missing teeth, or to support a denture or bridge. Dental implants may be an option for you if you are missing teeth. One of our dentists will assess your teeth and make a recommendation for your tooth replacement option based on your current oral health situation and needs. Other options for teeth replacement include dentures and bridges. Book an appointment today with Riverside Dental. We're open from 8am to 8pm Monday-Friday.